Choose from the widest variety of corporate promotional products thanks to Proactive HS, specialists in corporate clothing and corporate gifts. Select the ideal corporate gift, or choose your corporate clothing from our range of over 5,000 different promotional items, perfect for increasing brand awareness, and cementing business relationships in a professional and distinctive style. If you’re in search of corporate gifts or corporate clothing anywhere in South Africa, then Proactive HS is the company you’re looking for. With a huge selection of various corporate gifts and promotional items, and a range of corporate clothing, all of which can be uniquely branded with your logo, Proactive HS offers the best selection of corporate promotional items available anywhere. Contact us for great deals on promotional t-shirts. Includes free promotional print, in one colour on one side. Corporate gifts and promotional items serve as a constant and positive reminder of your business in the minds of your clients. Corporate gifts branded with your company logo help reinforce your corporate image and brand, and corporate clothing printed or embroidered with your logo creates a sense of professionalism, both inside the company and for your clients. Whether you’re looking to make a good impression on a big client, or interested in increasing public awareness of your company, we’ve got the promotional items, the executive corporate gifts and the corporate clothing that will suit your unique requirements. 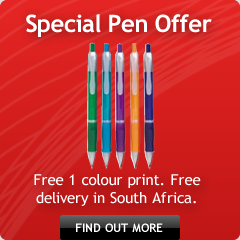 From bags to drinkware, hampers to office essentials annd one of the widest ranges of promotional pens in Johannesburg, you’ll find the best selection with Proactive. For more information on our promotional gifts and promotional clothing, and our various branding options, browse through our Corporate Gifts and Corporate Clothing pages, or Contact Us directly, and one of our consultants will be in touch.